Robert Bremner of Smerley Lybster died 8th April 1887 aged 73. Daughter Maggie died 22nd September 1875 aged 9. 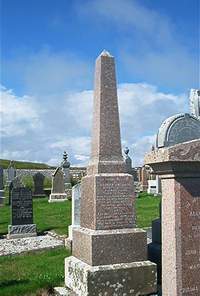 Son Donald Bremner died in Edinburgh 8th May 1888 aged 36. Son George Bremner died 12th December 1894 aged 41. Wife Christina Paterson died in Yonkers USA 14th November 1909 aged 83.